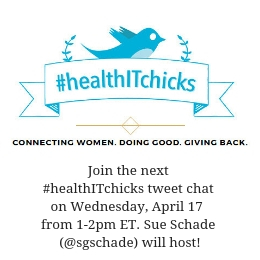 #HealthITchicks is a grassroots, high-energy networking group of women (and men!) focused on raising awareness of gender-related issues in healthcare technology and the workplace at large. The #healthITchicks community strives – above all – to help its members invest in the personal and professional lives of each other, and of those in need. share opportunities for personal and/or professional growth. Follow the @healthITchicks Twitter handle. Sign up for email updates (to your right). Join our next tweet chat. Find us out and about.